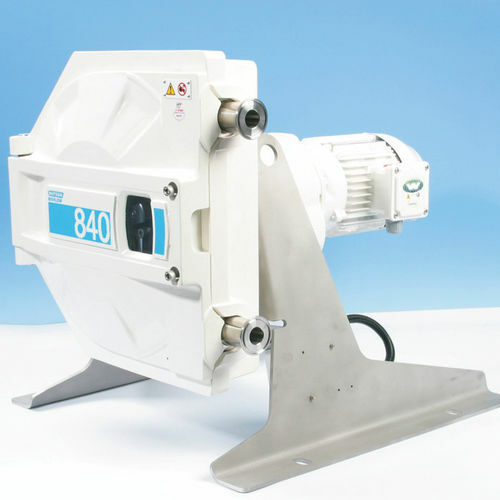 The WATSON MARLOW 800 series hygienic pumps with 840 pumphead offer high flow rates, CIP (clean-in-place) and SIP (steam-in-place) processes, while still being a cost effective choice. They feature maximum flow rates of 35 GPM (8,140 l/h), with operating pressure up to 50 PSI (3.5 bar) and are mainly used in various hygienic industries such as biotechnology, pharmaceutical and food industries. They have a robust, sturdy design, with a steel frame, and two stainless rollers that can lift off the USP Class VI Bioprene or GORE STA-PURE PCS tube, offering a clear cleaning path. They can use fixed speed motors, ATEX rated drives, ntegral Varmeca inverter drives, or inverter-rated variable speed motor gearboxes providing 4-20mA or 0-10V process control. They also feature a start/stop and reverse option.